Have you ever wondered who Valve tapped to be in its opening splash screens? Now we know. If you've played a Valve game, you've seen one of the company's splash screens that feature one of two different people with valves put into their heads and may have wondered who they are. They must be someone important to the company, right? As it turns out, no: They're just random people pulled off the street. 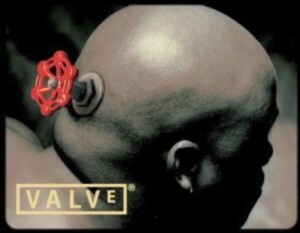 A Reddit user was curious about the "bald guy" in one of the splash screens and wrote to Valve about it. Valve's Ray Ueno wrote back with an interesting story. Ueno says he worked to help develop the "guy in the logo" back in in 1995 and 1996. Valve was using casting agencies to find models, but the company was regularly unhappy with the "supermodel" level of talent that they were providing. Valve wanted someone more real, so it ordered the agencies to go out on the street to find "everyday Joes." Ueno reveals that the "bald guy" seen in Valve's splash screen was "literally pulled out of a coffee shop or book store." 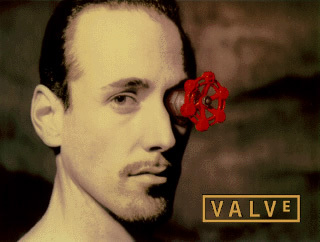 The second splash screen, featuring a model with a valve in his eye, also came from a similar origin. Valve doesn't even know who the models are, and considering that they're not professionals, they'd be pretty impossible to find today. Basically, there are two dudes wandering around the world that might have no clue millions of people are looking at them on a regular basis, questioning who they are. At least now we know the truth. As for the idea behind the valves themselves, Ueno says they signify Valve's "Open your mind, Open your eyes" concept for the company. Later, Ray added that fans have also been questioning why the "E" at the end of Valve is written in superscript, i.e. like this: VALVE. He's writing that story up now, so look forward to it in the near future.